James Sutorius and Kandis Chappell. Photo by Tracy Martin. Even a casual attendee of the theatre can tell that the sitting-room drama is currently experiencing a massive wave of popularity. It’s difficult to find a theatre these days that doesn’t have at least one show running about a group of horrible people yelling at each other in the same room. Some, like Yasmina Reza’s God of Carnage, are the most-produced plays in the world right now. 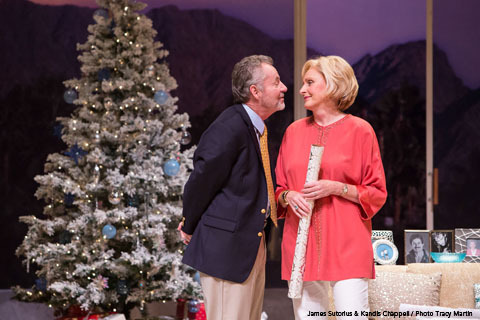 Jon Robin Baitz’s Other Desert Cities, which just finished its Theatreworks run in Mountain View, is an example of the best the niche has to offer. The play concerns the Wyeth family, a well-to-do family living in Southern California. Polly and Lyman Wyeth, the father and mother, are snooty Republicans; Polly is the ever-present psychologically abusive, alcoholic mother and Lyman acts as the more permissive parent. Trip Wyeth, their son, is a flippant, vapid reality show producer, and Brooke, their daughter and the closest equivalent the play has to a main character, is an author who recently recovered from a deep spell of depression. Rounding out the cast is Selda, Polly’s sister, former partner, and current recovering alcoholic trapped in the house next door. When Brooke reveals that she is about to publish a memoir about her brother, who firebombed an army recruiting station and then committed suicide, the tensions underlying the family’s interactions come to a head. Other Desert Cities takes the best of the sitting-room drama–the building tension, the subtly changing external and internal statuses of the characters–and avoids the larger problems with dialogue-heavy plays by keeping a fast pace and revealing more information with every conversation. There are issues with exposition being a little ham-handed and broader political issues appearing awkwardly in what should be a tightly focused, character-driven play, but the play as a whole is enjoyable enough that these are not particularly noticeable. In this production, the Wyeths often turned to the audience to deliver important lines, acting as if they are constantly in front of the camera. This direction is divisive and largely depends on your taste (I don’t like it much personally), but there is no denying that it fits a family used to outside surveillance. The acting was strong across the board, with nobody standing out as better than the others particularly. Unfortunately, the Theatreworks run is now over. However, the play itself is strong enough that if it opens again in the Bay Area or within a reachable distance, I would recommend buying a ticket.